What a thrill to introduce another friend, Lynn Custer. Lynn has been traveling with and encouraging Sally for over 20 years. She is an avid reader and book lover and gives books away with great abandon. Enjoy her first review! Christina Katerina has a very active and vivacious imagination. Things like tin cups, worn out dresses, old ties, and empty boxes interest her greatly. And why shouldn't they? There are so many things that can be done with old tin cups and old dresses! One day a delivery truck arrives with a new refrigerator. Both Christina Katerina and her Mother observe the men unloading the new appliance with much enthusiasm, but for two very different reasons. While her mother is excited about the new fridge, all Christina Katerina has her eye on is the huge box it came in. And at the very first chance, she lays claim to her prize, and drags it out to the front yard beneath the apple tree. Like most Moms, Christina's just wants to toss the box. There's no need to clutter the well manicured lawn with something that is meant for the trash can, but after some thought it is decided that it can't hurt to let it be there for a day or two. When Christina's Dad gets home, he gets out the hand saw and paint brushes. When they are finished the box is transformed into a castle complete with turrets, a drawbridge, and windows with 'iron' bars made from twigs. Christina Katerina brings every saucer and cup she owns, along with her bears and cookies. She and her bears live and play in peace inside the mighty fortress until Fats Watson, a neighborhood friend, comes over to playfully kicks the castle over. Mom is ready to haul the box away, but wait. It's no longer a castle, its a clubhouse! The upright box is remade into a side-laying club, where Christina and Fats are the only members. Keep out! Danger to Enemies! They spit on a nickel and swear to be friends forever. Unfortunately, this particular clubhouse wasn't designed to support Fats weight when he decides to sit on the roof. Out comes Mom again, ready to drag the heap to the trash, but wait.... it's not a clubhouse anymore. Now it is a racing car! Moving the top to the bottom and using the window as a cockpit, Christina races around the apple tree and wins every time. That is until Fats decides the motor doesn't sound quite right and decides to slice off the nose to see what the trouble is. Here is Mother again. This box is finally done for. Time to move on to other things. But wait! Christina has a ball to host and when she lays that box out flat it becomes the floor to her summer mansion. With paint brushes again, she paints a kitchen and a bedroom. And so she can hear the music while she and Fats and all her bears dance away, she paints in a grand piano and a violin. And dance they do, until Fats decides to scrub the floor. Spraying it down with the garden hose and mopping away all of the dirt, Fats scrubs until there really isn't a floor left. No more summer mansion. No more refrigerator box. Finally, Mother breathes a sigh of relief, happy to have her yard back… But is that Fats' Mom she sees coming across the lawn with two more boxes from her washer and dryer delivery this afternoon? 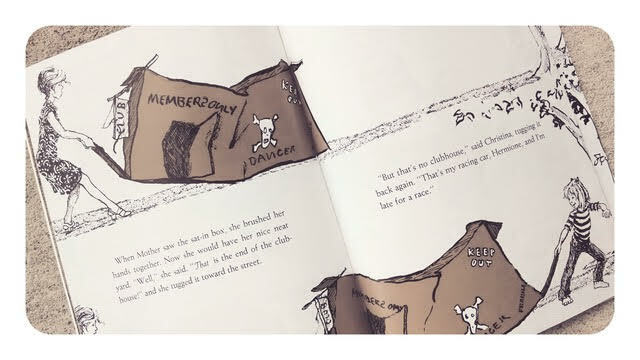 What a delightful book about the imagination of a child. 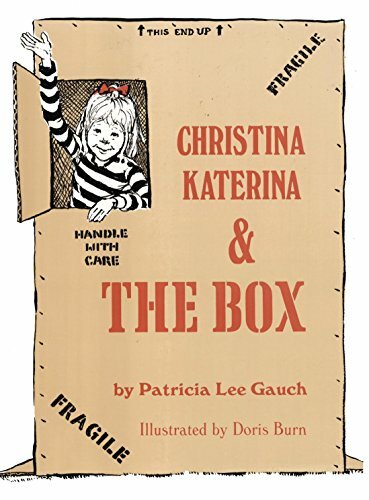 Christina Katerina & The Box is a book that will not only spark creative ideas in the minds of your children but will encourage you as Mothers to let the messes (and mistakes!) happen for the sake of creative play. In this day and age of all things hand-held and electronic, creative and inventive play is often times considered an inferior option and thus left ignored. However, so much research and countless studies have proven how important imaginative play really is for children. Not only has it been shown that behavior is improved, but it also improves academic performance, aids in problem solving, and helps to increase attention span. So many skills are developed when children are left alone to think, discover, imagine.... and dream! We as Moms could take a lesson from Christina Katerina's Mother and ask ourselves, "What could it hurt?" What could it hurt to let the mess be for a while? Let the children be with their box and their paints, or their whatever-it-is that we only see to be trash. So much is being done in the mind of that little-one when they are free to build and create and think. Reading this book aloud is a great place to start if you are one of those moms that has a hard time letting go of her visions of 'House Beautiful.’ If your children have had an overabundance of technology or are teetering on the edge of boredom and indifference…. Let them spend an afternoon with Christina Katerina, and see where their imaginations lead them.